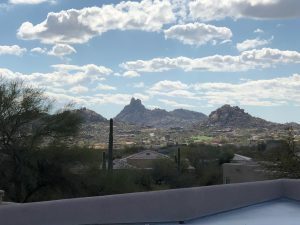 Nourish in Nature: A wellness retreat in Scottsdale, Arizona | Ridge's Stitches | Health Coach. Yoga. Clothing. 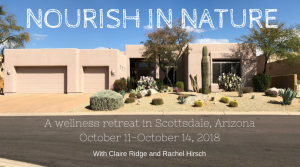 Join Claire Ridge and Rachel Hirsch on a wellness retreat in Scottsdale, Arizona. Experience yoga, mouth-watering food, and plenty of outdoor adventures. 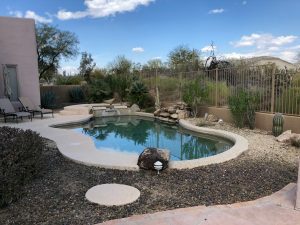 Unwind by the pool at a private home (30 minutes from PHX). Practice yoga and meditation daily. Eat local in-season foods. Hike the Brown’s Trail to Cone Mountain, Black Mountain, and Tom’s Thumb Trailhead. Cozy up at night by the bon fire. We will dive into how nature heals the body through food, movement and adventurous wonders of the world. Everyone interested in an active and healthy lifestyle and wants to learn ways to incorporate it more into their everyday routine. Individuals who are interested in learning more about their physical bodies through yoga, meditation, and hiking. Those who have an appreciation for food and the culinary cuisine of different parts of the world. The seekers who thrive on adventure and the beauties of nature. 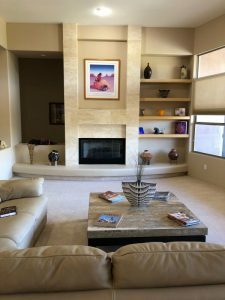 WHERE: A private home in Scottsdale, Arizona. Private and shared rooms available. Lounge by the private pool or hot tub. Enjoy yoga, meditation and sunbathing on the rooftop overlooking the mountains. Claire Ridge is a holistic health coach and certified yoga instructor originating from Kansas City. She has a passion for the mind-body connection. 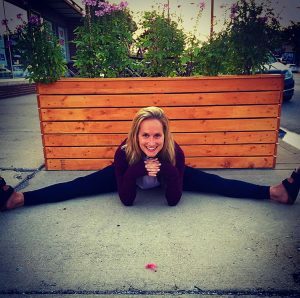 She currently lives in Chicago where she teaches weekly yoga classes at Yoga Six and Mirepoix Wellness Studio. She also hosts wellness workshops and events. You can find Claire in her home cooking up a storm with the wildest ingredients, reading a good book at the lake, or going to see a live show when Claire is not teaching yoga or holding wellness workshops. She likes avocados too. is a global yoga instructor currently living in London. Rachel fell in love with yoga during college in Austin. It allowed her to find a deep connection between her mind, body, and spirit. She loves exploring yoga throughout the world and integrates these experiences into her teaching style.Outside of yoga, Rachel loves traveling and is always exploring the world one adventure at a time. She fancies spending time outdoors, live music, and eating avocados. Wake up to mornings filled with mindfulness. 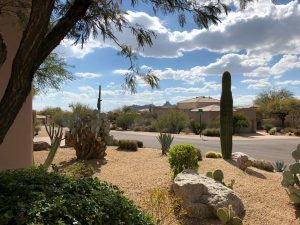 Enjoy the beautiful scenery of the Arizona desert, eat locally sourced organic meals, hike your heart out and practice yoga daily. This is the perfect retreat if you are looking to revamp yourself. Learn simple hacks to make more educated food choices. Feel accomplished and strong as you hike through Tom’s Thumb, Black Mountain, and Brown’s Ranch. Observe how getting in tune with nature can completely transform your normal routine. Claire and Rachel will guide you with foods and movement that will keep you energized throughout the day. Feel your best as you travel to see different wonders of the world. Relax by the pool, practice yoga on the roof with mountain views, and totally rejuvenate. Expect delicious, local, authentic and healthy Arizona cuisine. 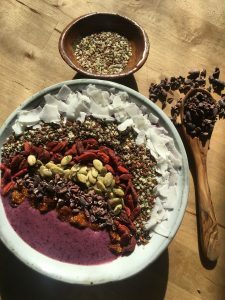 Salads, smoothie bowls, and nourishing snacks. We can accommodate all kinds of dietary restrictions and food allergies-just let us know in advance! Here is a sample itinerary of what we’ll experience together. Each day will be slightly different with exciting discoveries each moment! Fly into PHX on Thursday, October 11, 2018 and fly out Sunday, October 14th, 2018. Uber is your best mode of transportation to and from the airport. However, we will offer pickups for an additional $50 round trip. Prices range from $575 – $1,125 based on single or double occupancy. Payment plans available. Can I extend my stay at the home? Unfortunately, Rachel and Claire will be prepping for the retreat beforehand. Both of them have to get back home after the retreat. However, the Four Seasons is across the street. You are welcome to stay here for a few extra days. We will be happy to provide you with restaurant and activity recommendations and more! Airfare to and from PHX. Transportation to and from the airport unless you’d like that for an additional cost. Additional food, drinks & purchases while on excursions. Tons of yogis come on a retreat alone. Each of these yogis usually end up forming incredible bonds and sharing experiences that will last a lifetime. Don’t feel like you need to bring a buddy to join. We build a supportive community that feels like a home away from home. We only have a few spots for this grounding experience. Email NourishInNatureAZ@gmail.com for more information!